Samsung has been rolling out Android Pie for the Galaxy Note 9 and Galaxy S9/S9+ across the globe for a few weeks now. Those with carrier-locked units in North America have had to wait, though. That’s because carriers put firmware updates through an additional testing process which ends up delaying the rollout. The wait might be over in the very near future. 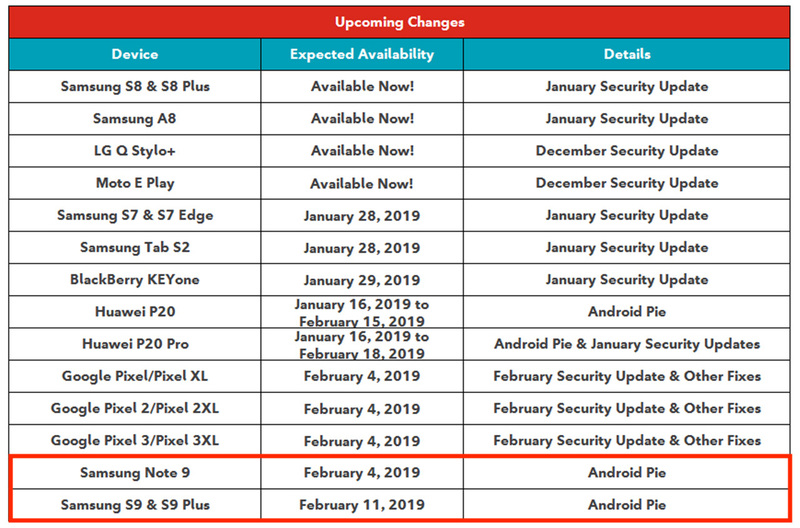 Canadian carrier Rogers has shared its Android Pie roadmap and it mentions that these Samsung devices will release Android Pie in early February. The roadmap shared by Rogers mentions that the Galaxy Note 9 will receive Android Pie on February 4 while the Galaxy S9 and Galaxy S9+ will get it a week later on February 11. This is effectively a ray of hope for users in the United States as well. The rollout of this update on a major North American carrier by next week means that it will not be long before US carriers start sending out Android Pie as well. T-Mobile, the third largest carrier in the United States, already mentions on its website that the Pie update is in development for these devices. It goes without saying that other carriers are gearing up to bring Pie to users on their network as well. There is thus a good possibility that we will see carrier-locked units of the Galaxy Note 9 and Galaxy S9/S9+ receiving Android Pie in the coming weeks. February is just a couple of days away so the wait isn’t going to be that long. We’ll be sure to update you when the carriers start sending out the Pie update for these devices on their network. Still waiting for the unlocked US update.. Finally received on my Note 9 UK this morning. Unlocked!!! I know this article is for the North American carriers but I don’t know why it takes them so long. My O2 UK branded S9+ firmware update was released OTA only three days after the stock UK firmware. Really shouldn’t take them so long.